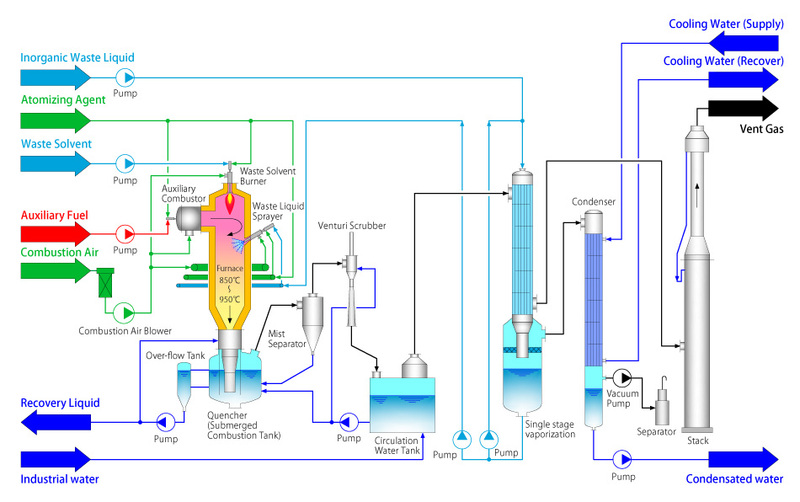 A number of production activities produce industrial waste in the form of liquids and gases. Environmental awareness around the world is gaining traction and tighter regulations and laws governing this waste are increasing. We help support this by offering advanced combustion technology. In addition, we continue to develop new technology in order to further environmental performance. Generally as waste liquid treatment, activated sludge method, water treatment and incineration method can be adopted. 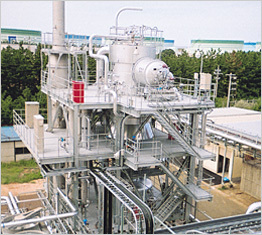 When Waste water is not possible to be treated by activated sludge and water treatment method as COD or BOD value is too high for this two ways, the incineration method shall be adopted. The “Waste Disposal and Public Cleansing Law”outlines the structure of the incinerators and the maintenance management standards. 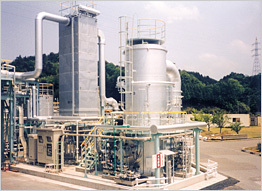 VOLCANO incinerators used for organic (highly concentrated) waste water, needless to say, fully comply with Japanese law by our unique combustion technology to be able to perform low energy consumption. By using the proper procedures, we can ensure full compliance with the standards established by the Air Pollution Control Law or by other laws and regulations set by local authorities as to “De-NOx” performance. 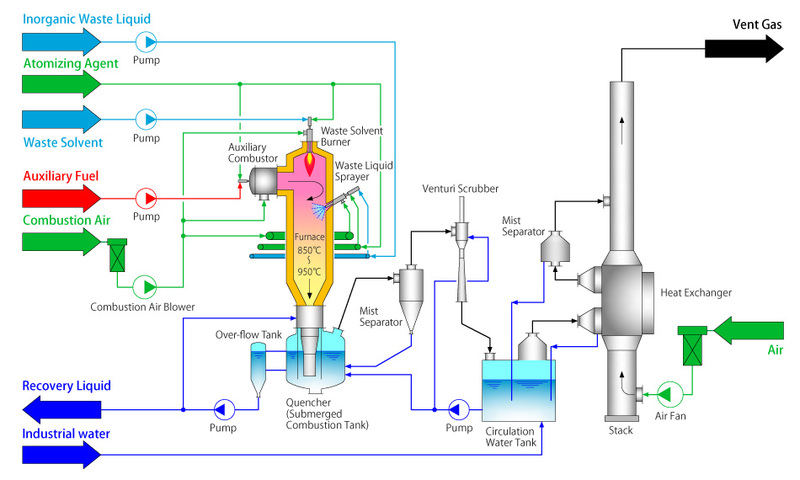 The standard flow for processing is: combustion chamber → waste heat recovery boiler → dust collector. As an added option, we can set up an air pre-heater in the process flow and recover even more exhaust heat and further reduce the amount of auxiliary fuel consumption. As nitrogen is present in the waste liquid, it produces NOx emissions. At Volcano, we use advanced combustion control technology to de-NOx or remove NOx gas in the two stage combustion process. Being involved in the development of submerged combustion equipment for approximately 50 years has enabled us to make technical advances and improvements. Submerged combustion incinerator for Alkaline waste water. When Alkaline waste is treated by the incinerator for organic (high concentration ) waste water, the followings are of concern, 1) refractory corrosion by inorganic salt, 2) blocking by molten salts 3) Fine solid salt fume’s (particle) problems. Thus, long periods of stable operation are not possible. Submerged incinerator is “Down Flow” type furnace. Auxiliary combustor is mounted on the top side, the waste water is sprayed into the furnace kept in the temp that the plug-in problem does not happen and instantly organics vaporized and thermally oxidized, forming CO2, H2O, Na2SO4 and NaCL. These salts become several micron-meters of molten fume and half of them flow donw along the internal wall surface of the furnace. This process make the waste water perfect decomposition. The quencher filled with sealing water is installed the outlet of the furnace. The flue gas containing inorganic salt are led to the dip tube and pass through the cooling water and then momentarily this gas starts drop down close to 90℃. The fumes that remain in the cooled gases are caught in the dust collector (venturi scrubber) and the particle in the exhaust gas is removed under the regulation. The exhaust gas without dust or fine particles are released into the atmosphere through the or stack. Liquid fuel, such as heavy oil and gas fuel, such as natural gas , can be used as auxiliary fuel. When a low quality or recycled oil is used, SNCR can be carried out in the furnace. This process makes it possible to remove “S” content in the fuel. Thus, these kinds of oil can be used. 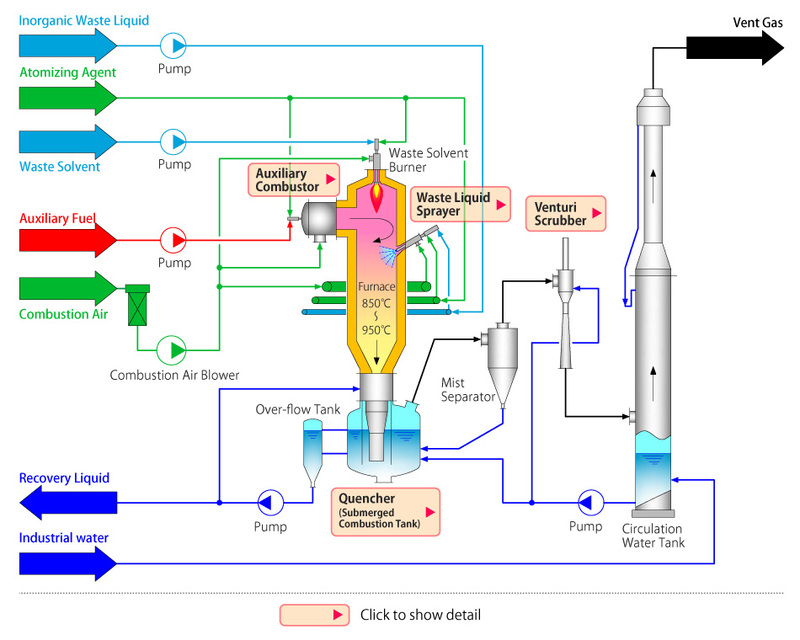 Furthermore, we can process various things simultaneously, like using the waste oil and emissions that have heat capacity as an auxiliary fuel source. In case that the calorific value of waste water is low and the capacity is large, the large amount of the auxiliary fuel is necessary and cause the running cost make the problems. 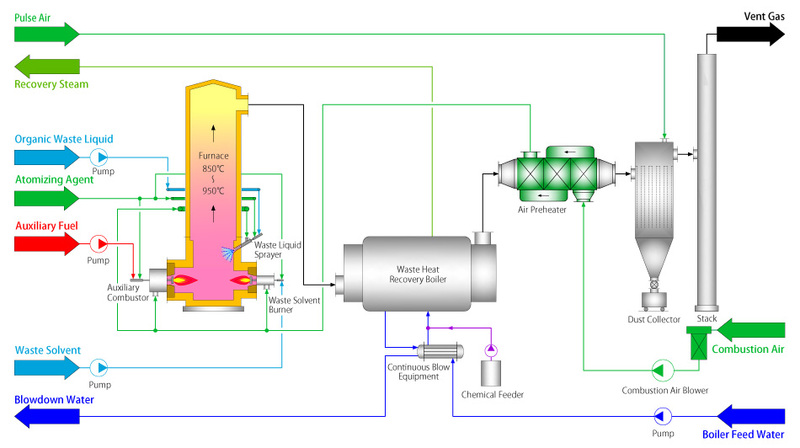 In this system, the heat or energy that emits from the waste liquid equipment is used and transferred to the evaporator to recycle the waste heat and preconcentrate the waste water, and thereby reducing the auxiliary fuel. However, when there is a high salt concentration in the waste liquid, the system must be carefully reviewed to determine the appropriate range, because crystallization after pre-concentration can become a problem. 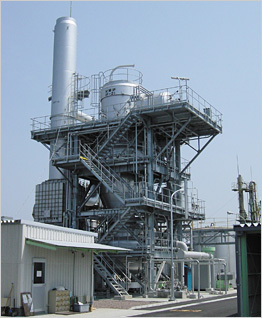 The exhaust gases released from the stack are humidified gases that are approximately 90 degrees. This emission fully complies with laws and regulations related to the environment, but the emissions turn to white smoke from the water vapor condensation. As a result, additional installations may be required as a countermeasure for the surrounding environment. We offer two methods to counteract this emission: dehumidification or dilution. After consultation, we can propose the right white smoke prevention option.